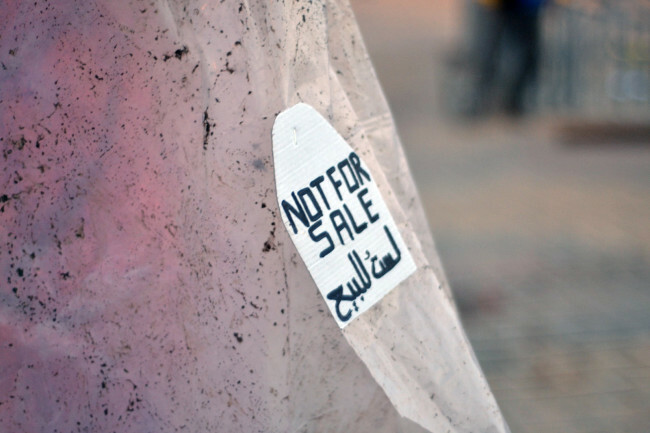 The sculpture NOT FOR SALE by Loay Al Hadhary shows a Yazidi woman wrapped in plastic foil, which represents the traditional Abaya robe. 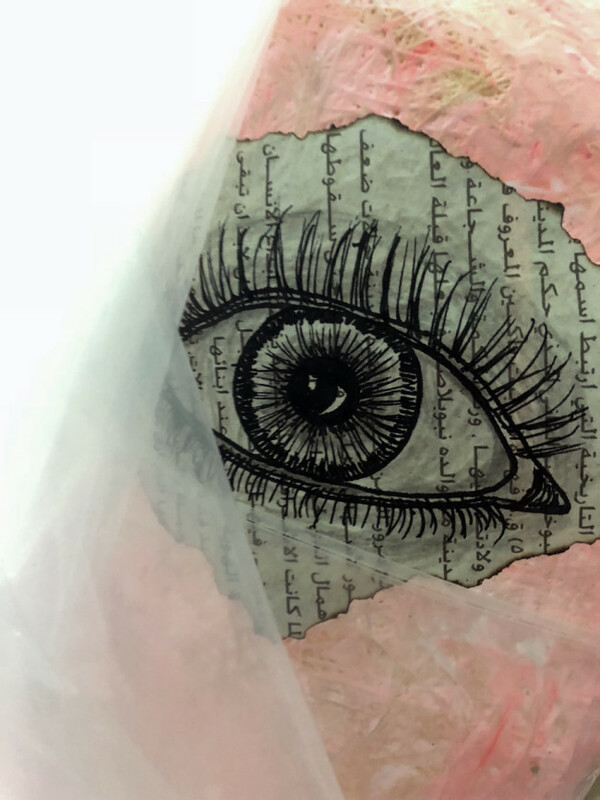 Underneath the semi-transparent veil, her naked skin is covered with marks, inscriptions of newspaper clippings and symbols that refer to slavery and misuse. Her hands are raised, tearing a chain apart. The statue stands for the fate of thousands of Yazidi women, kidnapped, enslaved, sold, and raped by members of the Islamic State (IS) during the years of genocide of the Yazidi community in Iraq. 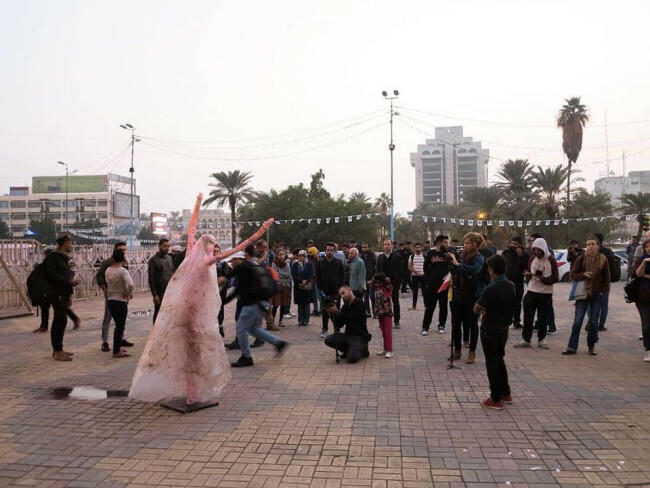 Al Hadhari positioned the sculpture underneath the Freedom Monument, known as Nasb al-Hurriyah, by sculptor Jawad Saleem and architect Rifat Chadirji, at Tahrir Square (Liberation Square), where people have historically held demonstrations. The monument was unveiled in 1961; it expresses the struggle of the Iraqi people before the 14 July Revolution in 1958 and commemorates the establishment of the Republic of Iraq. The monument symbolises the people’s strife against tyranny, a struggle that hasn’t been put to an end, fought again in the present day. IS has been pursuing a genocidal campaign against the Yazidi of Sinjar in northern Iraq, but to date, no perpetrator has been held accountable for the genocide. Ameen Mokdad: 1000 Iraqui Lip PrintsAt Karada Ridha Alwan Photos by Christina Werner	Videos by Christina Werner	Ameen Mokdad collected 1000 empty water bottles that littered the streets of Baghdad with his own hands and formed a large sphere from the waste material. This huge plastic ball was returned to the street, placed in the middle of Karada Dajel in front of Ridha Alwan Café and blocking traffic. 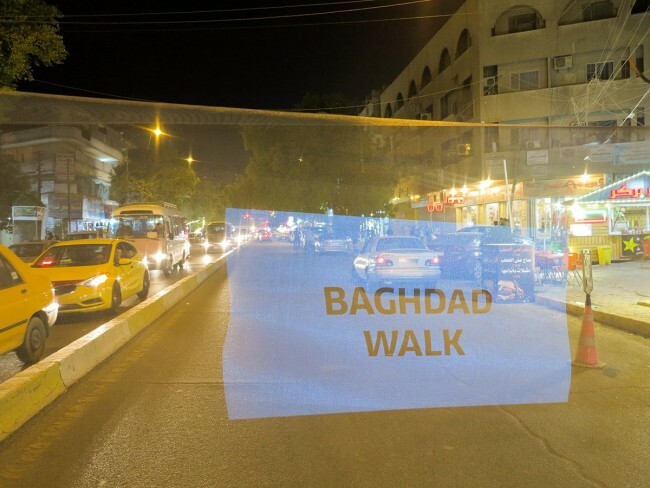 1000 IRAQI LIP PRINTS are 1000 pieces of evidence of polluting crime happening every second in Baghdad, the lip prints tracing back to the very DNA of individual involvement. With his intervention, Mokdad wanted to create awareness of the enormous amount of waste in Baghdad’s streets and how this is influenced by our understanding of which spaces we care for and how habits and responsibility for communal spaces are intertwined. The intervention took place on Karada Dajel, a thriving shopping street at the heart of the city of Karada, in front of the art cafe Ridha Alwan, where socially diverse clientele meet under one roof. The spot seemed ideal for eliciting diverse reactions from a mixed crowd in a quite everyday situation. To Mokdad, it was important that the audience comprised inhabitants of Baghdad, who can achieve change if they want. Ameen Mokdad: 1000 Iraqui Lip PrintsAt Karada Ridha Alwan Photos by Christina Werner	Videos by Christina Werner	Ameen Mokdad collected 1000 empty water bottles that littered the streets of Baghdad with his own hands and formed a large sphere from the waste material. This huge plastic ball was returned to the street, placed in the middle of Karada Dajel in front of Ridha Alwan Café and blocking traffic. 1000 IRAQI LIP PRINTS are 1000 pieces of evidence of polluting crime happening every second in Baghdad, the lip prints tracing back to the very DNA of individual involvement. With his intervention, Mokdad wanted to create awareness of the enormous amount of waste in Baghdad’s streets and how this is influenced by our understanding of which spaces we care for and how habits and responsibility for communal spaces are intertwined. The intervention took place on Karada Dajel, a thriving shopping street at the heart of the city of Karada, in front of the art cafe Ridha Alwan, where socially diverse clientele meet under one roof. The spot seemed ideal for eliciting diverse reactions from a mixed crowd in a quite everyday situation. To Mokdad, it was important that the audience comprised inhabitants of Baghdad, who can achieve change if they want. Tabarek Al Atrakchi: What Is A DreamIn front of the Calouste Gulbenkian Museum/Museum of Modern Art Photo by Christina Werner	Photo by Anees Amer	Photo by Christina Werner	Photo by Christina Werner	The installation WHAT IS A DREAM by Tabarek Al Atrakchi showed a series of crayon drawings made by street kids, in an installation setting that included an arabana (a kind of wheelbarrow for transporting goods) loaded with water bottles, chewing gum, and cleaning materials – all items that are typically sold by children on the street. Al Atrakchi sought out the children in the city streets and asked them to draw their dreams and to tell her what those dreams were about. WHAT IS A DREAM depicts the hopes and future visions of the children. The dreams range from having a boat to work on the river and becoming a photographer or a doctor to travelling to an island in the turquoise sea. Al Atrakchi criticises child labour and the living conditions of many street kids in Iraq by looking into their wishes for a future that contrasts their everyday situation. She presented her artwork in front of the Museum of Modern Art in Baghdad, the first exhibition space for modern art in Iraq, built in 1962 and also known as ‘The Gulbenkian Hall’. The place embodies a collision of worlds that is typical for Baghdad: the governmental, state-run art museum is located in the midst of a bazaar that gathers small businesses, day labourers, and the poorest of the city, from thieves to street kids. The children’s drawings on the street stand in an imagined dialogue with the art inside the galleries, while they show how far removed one reality is from the other. Tabarek Al Atrakchi: What Is A DreamIn front of the Calouste Gulbenkian Museum/Museum of Modern Art Photo by Christina Werner	Photo by Anees Amer	Photo by Christina Werner	Photo by Christina Werner	The installation WHAT IS A DREAM by Tabarek Al Atrakchi showed a series of crayon drawings made by street kids, in an installation setting that included an arabana (a kind of wheelbarrow for transporting goods) loaded with water bottles, chewing gum, and cleaning materials – all items that are typically sold by children on the street. Al Atrakchi sought out the children in the city streets and asked them to draw their dreams and to tell her what those dreams were about. WHAT IS A DREAM depicts the hopes and future visions of the children. The dreams range from having a boat to work on the river and becoming a photographer or a doctor to travelling to an island in the turquoise sea. Al Atrakchi criticises child labour and the living conditions of many street kids in Iraq by looking into their wishes for a future that contrasts their everyday situation. She presented her artwork in front of the Museum of Modern Art in Baghdad, the first exhibition space for modern art in Iraq, built in 1962 and also known as ‘The Gulbenkian Hall’. 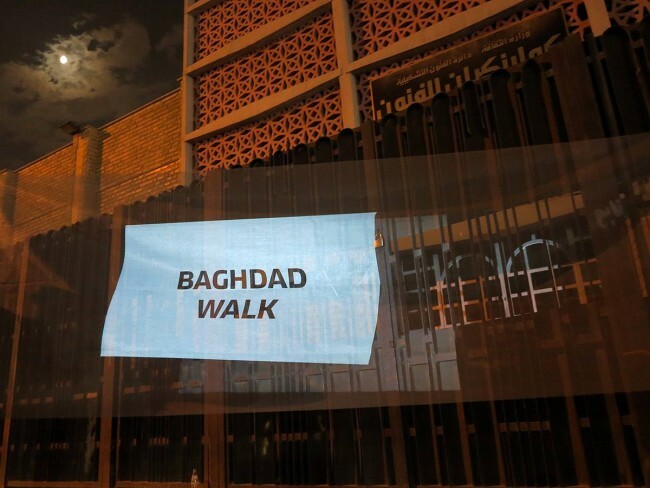 The place embodies a collision of worlds that is typical for Baghdad: the governmental, state-run art museum is located in the midst of a bazaar that gathers small businesses, day labourers, and the poorest of the city, from thieves to street kids. The children’s drawings on the street stand in an imagined dialogue with the art inside the galleries, while they show how far removed one reality is from the other.